New video, new sound, new voice – Harris is back in action! Save Me From Myself is the first single released by Awakening Records after his album Salam. The single was released before Ramadan earlier this year – and the video launched today! Harris J started singing at a young age, and naturally acquired a number of young fans as a result. It is fantastic to see Harris growing as an artist, and staying contemporary with his fans who are growing with him. How does this single compare to previous tracks? Save Me From Myself has a deep and meaningful tone when compared to his previous tracks. The song admits that not everyone is perfect, and we should turn to Allah in order to ask for forgiveness. This kind of attitude is perfectly in-line with the teachings of the Quran. We are taught that success is not about being perfect, but seeking forgiveness when you do make mistakes. We will explore the link between the lyrics and Quran, but let us watch the brand new video first. Awakening Records have now released the official Save Me From Myself video on their Youtube channel. As a video producer myself, I feel the urge to give it a min-review. 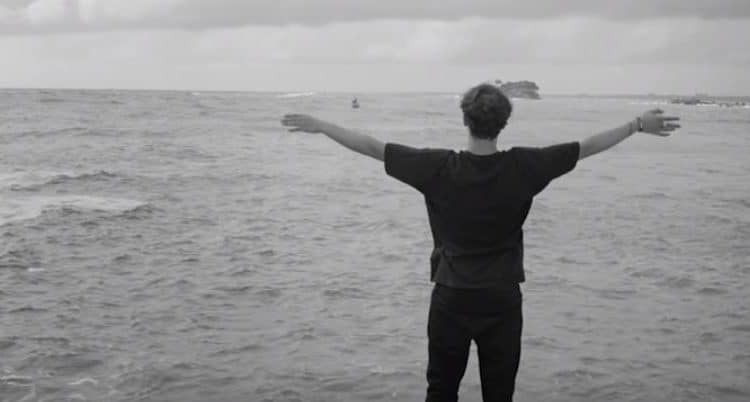 The video is filmed in black and white, which helps give the impression that Harris is alone with his thoughts, reflecting (as the Quran encourages). Harris wears two outfits in the video – all black and all white outfit – both can be seen in the same shot. This possibly represents his ideal self and actual self. He is trying to move towards a life of good, but finds it difficult due to the challenges that this world presents. At 2:36 he can be seen looking into the light before running, showing his determination and can-do attitude to succeed. At 2:58 he smashes a mirror which could be seen as breaking free from his former self, and moving forward with a new start. Trivia – At 3:29 the mirror appears to be back together? Despite Harris smashing it a few scenes before. Do you think this was deliberate or an error? Comment below. Overall the video is fantastic, making use of appropriate iconography and mis-en-scene to convey the message of the track. Le’ts go through the lyrics, calling out references to Quran and Hadith. Links to the Quran and hadith have been numbered above (in purple) and presented below. Indeed the Quran places emphasis on being patient. In fact it teaches that guiding towards patience is one of the requirements for being successful, and not at a loss. One of the most beautiful things about Islam is that we can obtain help by simply asking Allah directly. There is no person or object between us and him. Calling on anyone or anything else is known as ‘Shirk’ and is the worst sin one can commit in Islam. In fact, it’s the only unforgivable sin in the religion. The title of the track, and a powerful line indeed. Sometimes we are our own enemy. Human beings were not designed to be sinless, and success is not defined by the one who does not sin. Rather it is defined by the one who asks for forgiveness after they sin, and make an effort to stop that sin. It’s fantastic to hear a track of this nature. I feel many can relate to the topic and the links to Islam are strong. …but what did you think of the track? Leave a comment and rate the track using the star system below.